The Consumer Price Index (CPI) rose 0.1% in November following a 0.2% gain in the prior month. 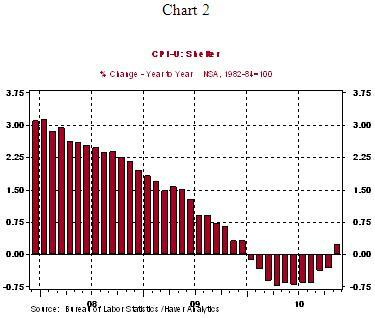 The CPI has risen 1.1% from a year ago compared with a 1.8% gain in the 12-month period ended November 2009. Energy prices increased only 0.2% in November vs. a 2.6% gain in October. The price index for natural gas (-5.7%) fell but gasoline prices (+0.7%) advanced for the fifth straight month, with November recording the smallest of these five monthly gains. The food price index moved up 0.2% in November after a 0.1% increase in the prior month. 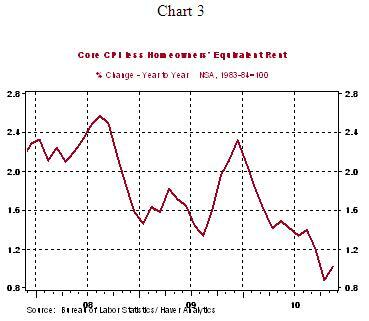 The important message is that the CPI continues to show a distinct decelerating trend (see Chart 1). 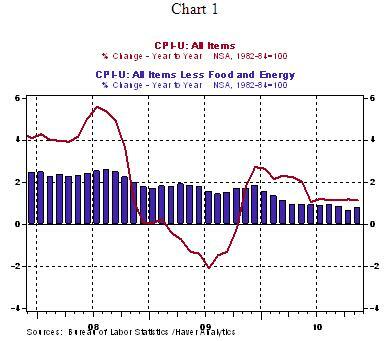 The core CPI, which excludes food and energy, also advanced 0.1% after holding steady in the August-October period. On a year-to-year basis, the core CPI rose 0.8% in November, with recent year-to-year changes in the core CPI hovering close to historical lows. As noted earlier, much like the all items CPI, the core CPI also shows a marked deceleration from a year ago (see Chart 2). These readings are below ranges consistent with price stability. The Fed's dual mandate of price stability and full employment is the major factor that motivated the second round of asset purchases, known as QE2. Details of the report show lower prices for new (-0.4%) and used cars (-0.5%) and a decline in hotel prices (-1.2%) in November. Higher prices for apparel (+0.2% after three monthly declines), medical care (+0.1%), and shelter (+0.1%) more than offset these declines. On a year-to-year basis, shelter costs, the largest component of the core CPI, advanced 0.2% in November, the first gain since December 2009 (see Chart 2). Declines in owners' equivalent rent, the major sub-component of shelter, has held down the overall trend of shelter costs. In November, this index moved up 0.2% from a year ago and lifted overall shelter costs. In addition, the year-to-year change in the core CPI excluding owners' equivalent rent also established a bottom in October (+0.8%) and rose 1.0% in November (see chart 3). Although a single month's reading is inadequate, charts 2 and 3 suggest that economic conditions are turning around to bring about a small increase in underlying core inflation, which is the Fed's current objective.